Mumbai Indians (MI) will face Rajasthan Royals (RR) in the match no 27 of VIVO Indian Premier League (IPL), 2019. The action will take place at Wankhede Stadium, Mumbai which is MI team's home ground. 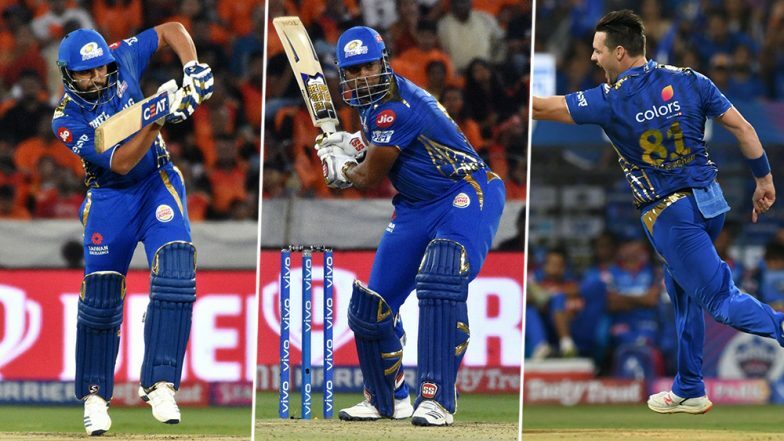 Mumbai Indian's player Rohit Sharma, Kieron Pollard and Mitchell McClenaghan dance with kids in ESA activity ahead of MI vs RR match IPL 2019. IPL 2019 Today's Cricket Match Schedule, Start Time, Points Table, Live Streaming, Live Score of April 12 T20 Game and Highlights of Previous Match! Mumbai Indian team is on a roll with only two defeats till now in IPL 2019. MI has 8 points and currently sit at third positions on the point table. Mumbai defeated Punjab in their last game by three wickets as they chased down the total of 197posted by Punjab. MI side was led by Kieron Pollard in this match following Rohit Sharma muscle pull injury. Pollard played a fantastic knock of 83(31) to guide his team to victory. Speaking about MI pacer Mitchell McClenaghan, he has played only three matches till now in this season of IPL. The New Zealander took three wickets with a figure of 3/40 against Delhi Capitals in MI's opening game at Wankhede. McClenaghan played a big role in Mumbai Indians title victory in IPL 2015. Mumbai Indians Captain Rohit Sharma Shares Cute Picture of His Pet Dog on National Pet Day 2019. Mumbai Indians started the initiative Education for All (EFA) in the year 2010 to support underprivileged students through education.EFA evolved to Education and Sports for All (ESA) in 2018. ESA is also an initiative of Reliance Foundation, to provide education and sports facility to the poor and needy children. All the children at the #ESA activity made sure that @ImRo45, @Mitch_Savage and @KieronPollard55 showed off their footwork. Now whether Rohit Sharma will play against Rajasthan or not, it's a big question. Keeping the upcoming ICC World Cup 2019 in mind, Rohit will not want to take any risk and push himself beyond the limit. As of now, Mumbai is doing good in IPL and hopefully, they should be able to win few more matches from here to make it to the playoffs.